The New York Times columnist is so obsessed with women’s fertility, it’s too bad he can’t get pregnant himself. 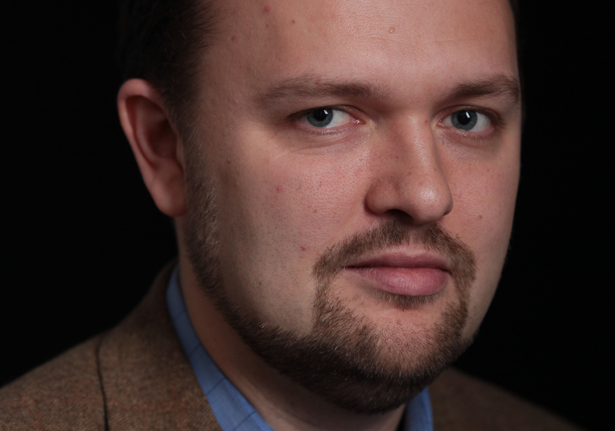 Ross Douthat, The New York Times’s Catholic-conservative columnist, is so obsessed with women’s fertility it’s really too bad he can’t get pregnant himself and see firsthand what it’s all about. Then he might understand a bit more about what women are up against in this world, and why he is wasting his time fretting about hookups and birth control, inveighing against abortion rights and urging women to have large families for the greater glory of God and country. “More Babies, Please” is his latest effort in this vein, keyed to a recent Pew Research Center report that finds that the birthrate fell rapidly between 2007 and 2011 and now stands at the lowest point since 1920, when accurate record-keeping began. The big surprise is that the drop was led by immigrant women, who have historically had more kids than the native-born: while for US-born women the birthrate declined by 6 percent, for foreign-born women it was 14 percent and for Mexican-born women a whopping 23 percent. There are a lot of ways to read this drop: the recession makes people cautious; more women are using better birth control; the more seriously women take their education and their jobs, the less likely they are to have kids before they are good and ready. For college-educated women, raising a child not only costs a fortune while lowering a mother’s income for life; standards of good mothering have been raised so ridiculously high you might as well commit to joining a Buddhist monastery. As for low-income women, pushing them to have fewer kids was one of the goals of welfare reform: maybe it worked. Oh, honestly. What nonsense. The United States is one of the most innovative countries in the world: we’re so future-oriented we can barely be bothered to read the Times on paper anymore, or buy a book in an actual bookstore—or buy a book, period. The supposedly creative destruction of capitalism is what America’s all about. Granted, it’s nice to hear raising children frankly described as a sacrifice—although surely not one as big as it was back in the days of astronomical rates of death or injury in childbirth, when Theodore Roosevelt was thundering against the “race suicide” committed by white women limiting their fertility. (“Did I write you of my delight at meeting one Hiram Tower, his wife and his seventeen children?” he wrote to Henry Cabot Lodge.) Credit where due: prophets of “demographic winter” usually warn against declining numbers of white people, but Douthat is too savvy to mention as a special concern the fact that white American women have a fertility rate of 1.8, way down there with the women of Old Europe. Would you have an extra baby if you got a bigger tax deduction for it? If your boss let you work ten hours a day four days a week or one afternoon at home? If college was a little less expensive? (And how is that supposed to happen, I wonder, without massive government subsidies? See above: “tax cuts.”) I doubt it. France and Sweden have massive, comprehensive, well-thought-out programs to make motherhood less onerous: generous parental leave (in Sweden the father must take part of it), national healthcare that covers birth control and abortion care, good schools, excellent daycare and preschool, a panoply of family subsidies and worker protections. Higher education is basically free. For the working-class people Douthat focuses on, life is just better. Single mothers—yes, sluts—can manage well. Those countries acknowledge that mothers work, and want to work, and that all children deserve a decent upbringing. According to UNICEF, in France the child poverty rate is 8.8 percent; in Sweden it’s 7.3 percent. In the United States, by contrast, it’s a staggering 23.1 percent. You know where else support for working mothers and children meant more kids? The Soviet Union and East Germany, both now in severe population decline, thanks to the wonders of capitalism. You know where the birthrate is lowest? Patriarchal countries where having a baby means you stay home forever: Italy, Spain, Greece, Japan, Singapore and that jewel in the crown of Roman Catholicism, Poland. How would you like to be a Japanese or Polish or Italian housewife, Ross Douthat? I thought not. I’m not so sure why we want more people on our crowded, overheated planet, where world population is projected to increase by 2 billion before finally beginning to fall. But if Douthat really thought through what it means to have and raise a child these days, I’m sure he could come up with a lot of great ways to help women and families. The trouble is, he couldn’t be a Republican anymore. He’d be a socialist. Don’t look now, but feminists have won the culture wars. Jessica Valenti explains how and why.